It’s difficult to pick the top health ailments in Louisiana. The ways to construct such a list of both syndromes and specific diseases are abundant. Most minor respiratory symptoms resolve with tincture of time. Current treatment guidelines, usually written by so-called experts not in the trenches of providing primary care, stress the importance of not prescribing antibiotics for persons with simple nasal congestion, bronchitis, coughs, lingering colds and the like. This is where medicine the art supersedes medicine the science. I am quick to prescribe doxycycline, a cheap and relatively safe broad-spectrum antibiotic that also packs an anti-inflammatory punch, for these questionable situations. I usually avoid Z-Paks, Levaquin and newer antimicrobials because they have more adverse effects, fuel resistance problems and cost more than the average office visit. Seasonal and even year-round respiratory allergies are the bane of living in our hot, humid climate. Everything – from dust mites to cockroach parts – is suspect. Various expectorants and prescription inhalers can work magic. Cough is a natural reflex to “bring it up” but a cough suppressant is occasionally indicated. Antihistamines can help, especially if taken before contact with the allergen or maybe shortly after symptoms start. Hypertension is the most common chronic disease bringing folks to see general internists on a recurring basis. Untreated chronic hypertension over time increases the likelihood of strokes, heart attacks, hardening of the arteries and congestive heart failure. Diet, weight loss and so-called lifestyle changes are important, but the root cause for most folks lies in their genetic makeup. Early treatment of hypertension is optimal. Antecedent fluctuating blood pressures are common before sustained hypertension. Forget about “white coat hypertension.” Folks with up and down elevated values (labile hypertension) should not postpone definitive treatment. If I had to pick a single disease that has taken our state by storm in the last 50 years it would be obesity. The hair on my neck bristles every time I hear someone blame Louisiana food for our obesity epidemic. Our blend of Creole and Cajun foods served us well for centuries before our collective waistlines started expanding eight to 10 inches some 40 to 50 years ago. For proof, look at old newspaper pictures with an eye for what I call the obesity index. Occasionally a newspaper or magazine will publish a 1967 picture of Saints fans in the old Tulane stadium. Contrast the number of obviously obese fans then to now. This same expanding epidemic of tummy fat is also easily visible in then-and-now pictures of shoppers from Canal Street in New Orleans to Ryan Street in Lake Charles. No doubt a more sedentary lifestyle plays a role. But in my opinion, the leading villain causing our expanding abdomens is the fast-food epidemic fueled by sugar and sugar substitutes sending coded messages to the brain to consume more calories. As a population, we are consuming more calories than we did 50 years ago. And, as we eat fewer meals prepared and cooked at home, we are eating less healthy food. The culprit is not our traditional and famous food; the culprit is the invasion of fast and takeout food that has consumed us like kudzu-covered Mississippi. Obesity and hypertension are two of the three components of the metabolic syndrome, a condition unknown to most, even though it affects more than a third of our state’s adult population. Most folks know that onion, celery and bell pepper are our culinary holy trinity. A lesser-known unholy trinity is the elevated blood pressure, abdominal obesity and a slightly abnormal glucose or lipid level comprising the metabolic syndrome. People with clusters of these separate risk-factors are at a much higher than normal risk for developing diabetes, heart attacks, strokes and an increasing number of other recognized complications from psoriasis to erectile dysfunction. Obesity is also a risk factor for snoring and other common sleep disorders. The inability to fall to sleep quickly or stay asleep is the driving force for most patients who request sleeping pills. Often times the real diagnosis is obstructive sleep apnea. Sleeping pills and metabolic syndrome are best friends. Hypnotics rarely promote normal sleep patterns. Disordered deep sleep in particular can cause or fuel weight gain, fatigue, hypertension, depression, excessive daytime drowsiness, attention deficit disorders, fibromyalgia and troublesome anxiety. We almost hit a trifecta with sexually transmitted diseases, thanks to blundering cuts to our state’s public health funding. The syphilis rate in Louisiana is the highest of all states, and the first runner-up isn’t even close. We are also No. 1 in gonorrhea, with Mississippi as a close second. For AIDS in the country’s 100 largest cities, at least we don’t lead the pack. Miami is No.1, followed by New Orleans and Baton Rouge in second and third places, ranked by the number of cases per 100,000 population. Cancer is a mixed bag of diseases that deserves its own top 10 list. 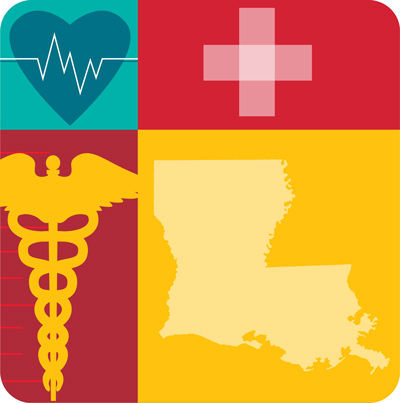 According to one research consortium, about 160 Louisianians a week die of cancer-related causes. Even so, our true incidence of serious cancers is not all that out of line with other states. We just have higher death rates. The reasons are certainly multifactorial. Two contenders are delayed diagnoses and lessthan-optimal treatment with more, rather than less, often being the culprit. A prime example is the now-closed bone marrow transplant center for women with breast cancer in an Uptown New Orleans hospital. The costly treatments were associated with more complications than benefits. Any list of top medical problems in our state would be incomplete if it did not include substance abuse. Our citizens are more likely to be long-term tobacco users than our neighbors in the North and West, fueling chronic obstructive pulmonary diseases. It is hard to walk through a casino without seeing a person on portable oxygen at the slots. I am not sure how our problems with gambling, alcohol and illegal drug abuse compare with the other 49 states, but I have not heard Gov. Jindal bragging about reduction of these rates as he scouts his prospects for an out-of-state gig. At least Jindal does not have to take blame for our high skin cancer rates, a problem caused by our positioning on the planet and the sun. We do need to pay more attention to sun protection and sunscreens. People with metabolic syndrome are at increased risk for atherosclerosis, peripheral vascular disease, coronary heart disease and heart attack, stroke and Type 2 diabetes. Check out My Life Check for a scoring tool and checklist to improve your cardiovascular health and reduce individual risk factors whether you have metabolic syndrome or not.